VANKLEEK HILL, ON – The beer delivery service launched today by Beau’s All-Natural Brewery has been shut down by the Alcohol & Gaming Commission of Ontario (AGCO) due to a complaint by a competing brewery. 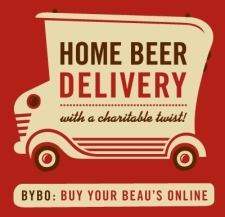 As explained in a press release and blog post, the Buy Your Beau’s Online (BYBO) project – which was providing home delivery of Beau’s products in Ottawa and offering both employment and financial support to at-risk youth via the charity Operation Come Home – was originally given approval to operate. But following the complaint by the as-yet-unspecified competitor, the AGCO ordered an immediate end to the service, telling Beau’s that the wording of the standard Home Delivery License issued to Operation Come Home only allows for the delivery of alcohol purchased from the LCBO or The Beer Store – the former a provincial Crown corporation, and the latter a private partnership owned by Ontario’s three largest breweries. It has not been announced if Beau’s or Operation Come Home will be attempting to appeal this matter, or if any further action will be taken. Why is there no word yet from the Ontario Craft Brewers on this? They should be very vocal on this situation and the beer retail system in Ontario as a whole. C’mon micro brewers of Ontario, let your voice be heard now!!! Steam Whistle does their own home delivery, which is legal under current legislation. The issue with the Beau’s arrangement was that they had a third party doing the delivery. And McGuinty was actually very quick to move on getting the legislation changed as soon as he was made aware of it. He’s actually a fan of craft beer, and recognizes the import role that microbreweries play in local economies.